This district includes lands along and east of the Blue Ridge Escarpment bordering the Piedmont of NC, including some of the area's most spectacular natural features. 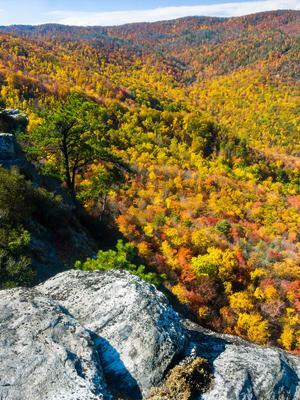 View fom the Blue Ridge Parkway across Lost Cove Cliffs and beyond with fall color creeping in at higher elevations. Its borders roughly include Interstate 40 to the South, US Hwy. 70 to the East, US Hwy. 321 to the North, and the Blue Ridge Parkway and Eastern Continental Divide to the West. Since the area is so large, it is divided into several sub-trailheads for this site. In the southern end of the district, you'll find the Catawba Falls area, a newly accessible piece of property which has been in Forest Service ownership for years but was never legally open to the public. 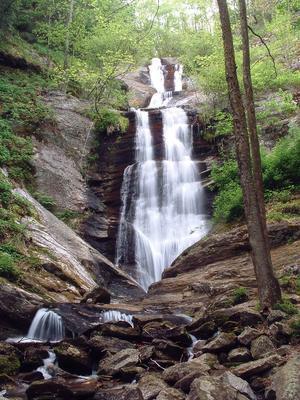 It has two of the region's most significant waterfalls. A new parking area, major trail improvements, and spectacular scenery makes a visit to Catawba Falls highly recommended! Catawba Falls has its own trailhead page. North of that, and across I-40 near the town of Old Fort, are a few heavily used trails in the Mill Creek drainage. Young's Ridge and Kitsuma Peak climb the ridge from the Old Fort Picnic Area to near Ridgecrest, while the Point Lookout trail is an easy greenway path covering the same route on a historic old highway bed. Heartbreak Ridge and Star Gap are difficult trails which climb all the way to the Blue Ridge not far from Mount Mitchell, joining the trails in the Black Mountains & Toe River trailhead area. Continuing northeast from the Mill Creek area, you'll pass the Jarrett Creek drainage and find the Curtis Creek area, which contains the first piece of land east of the Mississippi purchased by the National Forest Service under the authority of the Weeks Act of 1911. This area is now dedicated to Dr. Chase P. Ambler, who was committed to helping preserve these lands and who also built Rattlesnake Lodge, the remains of which can be found alongside the Blue Ridge Parkway just north of Asheville. 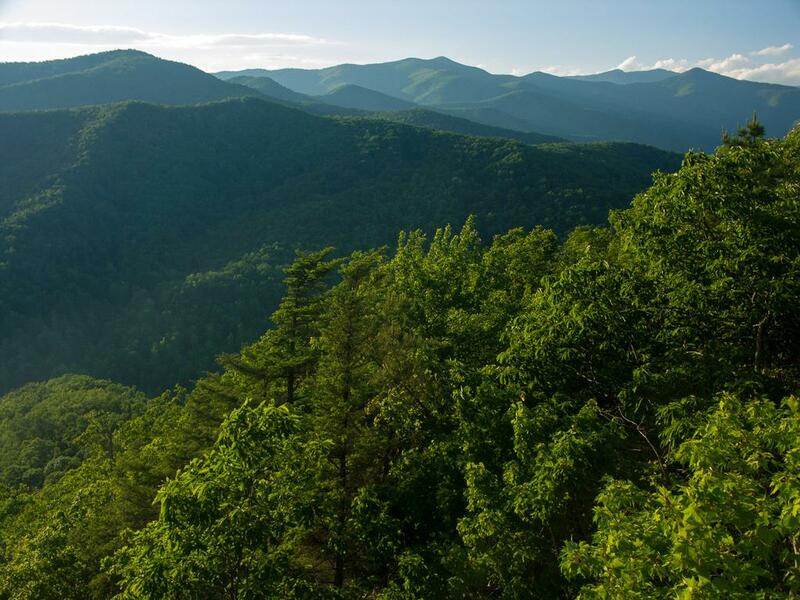 A mountain peak within the Great Smoky Mountains National Park bears his name as well. Fall color view from Big Lost Cove Cliffs, in the Wilson Creek area of the Grandfather Ranger District. Trails in the Curtis Creek area are long and largely remote, and include Snooks Nose, Hickory Branch, and Mackey Mountain. Details about Curtis Creek can be found here on its trailhead page. Progressing northeastward, you'll pass the Mackey Creek, Buck Creek, and Amstrong Creek drainages before crossing US Hwy. 221 at the North Fork Catawba River. 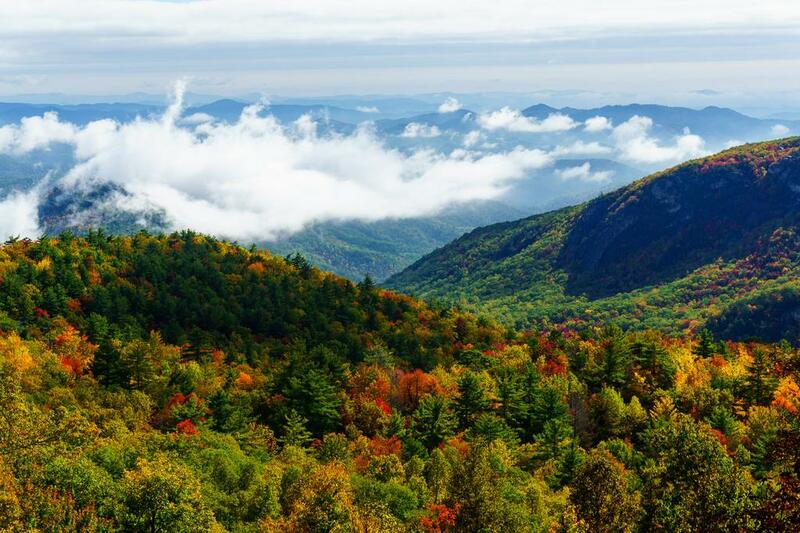 On the east side of 221 is the Linville Gorge area, which is the deepest gorge east of the Mississippi river. A vast network of trails and a designated Wilderness area covers Linville Gorge. Trails on the rim are less secluded and include spectacular views into the gorge itself. The Linville Gorge trailhead page has all the details. Farther northeast, the Roses Creek, Steels Creek, and Upper Creek watersheds all contain some public land and opportunities for hiking. Next on the trip northeast, the larger Wilson Creek drainage area is known for its waterfalls. Wilson Creek is designated as a National Wild and Scenic River and surrounded by public lands. Trails in Wilson Creek range from easy to very difficult, although many of them are in between. This includes the Harper Creek and Lost Cove trails. Wilson Creek also gets its own trailhead page. The North Carolina Mountains to Sea Trail traverses the district from north of Curtis Creek all the way to Wilson Creek, tying a lot of other trails and areas together. Several trails in this District connect with Blue Ridge Parkway property. The district's namesake, Grandfather Mountain, is under private and State ownership (covered on our Grandfather Mountain State Park trailhead page) and is bordered by both National Forest and Blue Ridge Parkway lands. Excellent trails exist on the privately owned Grandfather Mountain attraction as well, and they should not be missed. We have detailed information on the trailhead areas listed below. Choose one for more information!